Captain Sprocket never joined the Mighty Crusaders. Fly-Man, The Comet, Black Hood & The Shield (as the Mighty Crusaders) made a cameo appearance in a Captain Sprocket story. 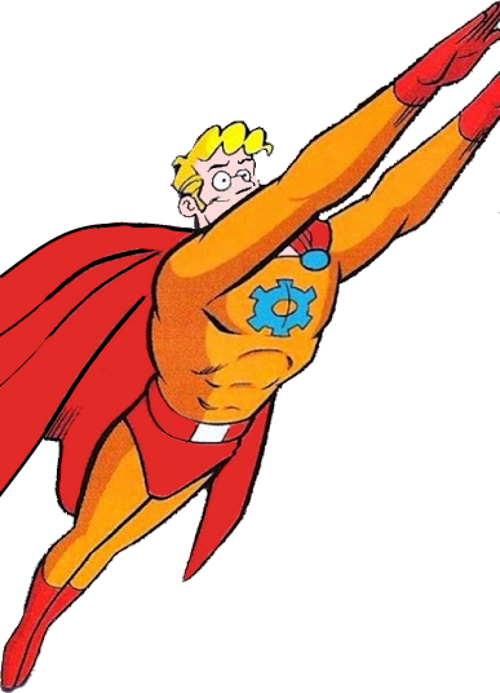 Captain Sprocket appeared throughout the run of Archie’s Madhouse at irregular intervals. A “Lady Sprocket” teamed up with him for one (mis)adventure in Archie’s Madhouse #41 (August 1965). It should be noted this parody of the super-hero genre pre-dated the campy “Batman” TV series by almost three years. The Captain eventually developed into a blue-light-special Superman, usually defeating his villains using brains…well, comedy…not brawn. In his first story, however, he was billed as “The World’s Only Three-In-One Hero; Space Scientist, Space Adventurer, Space Loverboy”. That story introduced his personal space cruiser, rocket jacket, and bag filled with an arsenal of scientific weapons.